Dustforce is just over a year old now. How well has it fared in the past year, and what does that mean for Hitbox Team? In this article, we discuss in great detail the financial performance of Dustforce, in the context of our own goals for the game. 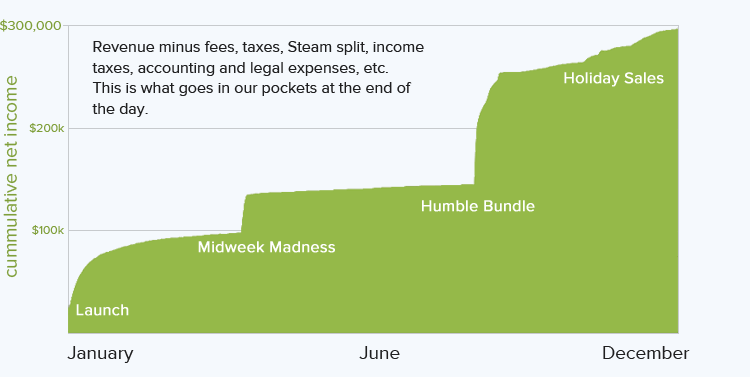 Come and learn about some of the financial issues of a tiny development team, such as how we funded Dustforce, and how much it costs to make a game. 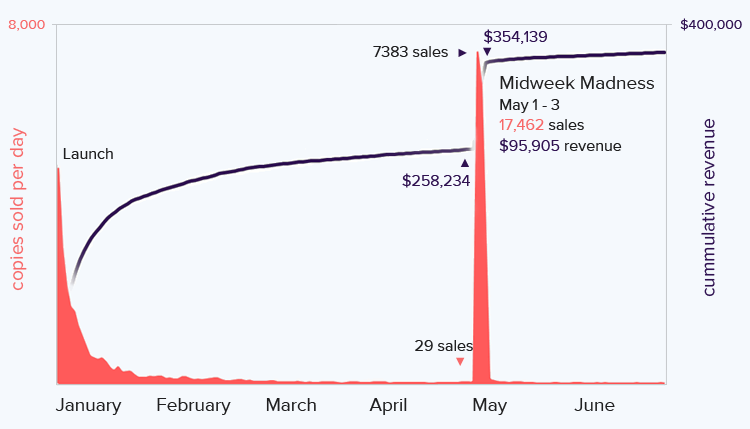 Finding game sales data is notoriously hard. Video games have traditionally been a "hits driven" industry — the majority of revenue for a publisher comes from a handful of big commercial successes. 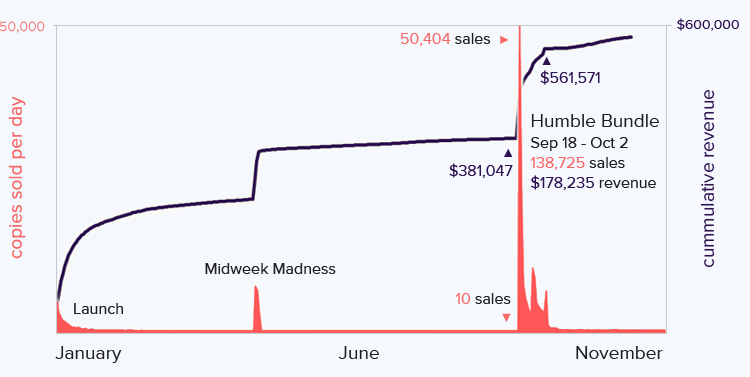 With so many non-hits being made, publishers try to keep sales numbers a trade secret, as the more disappointing figures can be worrisome to investors. 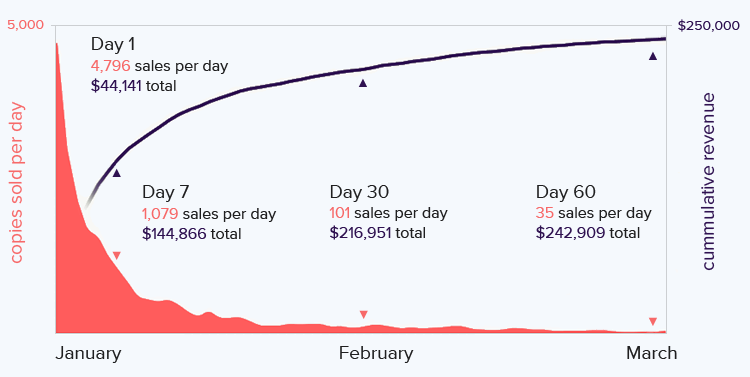 This trend has made discussing sales figures an uncomfortable topic, akin to talking about your salary. 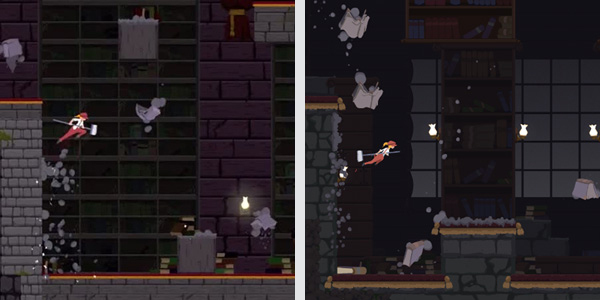 Left: The original prototype of Dustforce, made in GameMaker. Right: Dustforce as it is today, built in our own engine. In the few days after the prototype was posted online, an article on IndieGames.com drew some positive attention. Woodley and Lexie received an email from Valve, inviting them to put Dustforce onto Steam. This was the motivation they needed to work on Dustforce full time, to turn it from a prototype into a full game. It wouldn't be an easy task — the prototype was far from the final vision, and would take more than just two people to finish the game. All you really need to make a game is a computer and basic living expenses. Time is money, as they say, and we needed roughly a year and a half to finish Dustforce. How much does a year cost? We were all living in different areas of the world at the time (Brisbane, Tokyo, New York, and Cincinnati) — on average, it would cost us around $20k per person per year to live frugally. A lot of the prize money went to paying existing bills, debts, and traveling expenses. Between three people (the fourth lived off his own savings), the remaining money would last about one and a half years. For every $10 copy of Dustforce sold, $4.41 of it ended up in our pockets. Our friend Mary, from IndieViddy, helped us market Dustforce by sending review copies of the game to numerous reviewers and bloggers. She also created and sent out press releases, as well as helped make Youtube videos for us at a time when we were most busy. Without a doubt, yes, it was worth it. It is true that the final earnings, spread out among four people to account for almost 2 years of development is not particularly impressive, considering that more money could have been made at normal jobs, without taking the considerable risks that we took. However, it's important to note that the entire time we were doing what we loved, not for the goal of a monetary reward, but in order to make something beautiful come into existence. Lastly, our relative success of Dustforce was a fantastic foundation for us as a studio. We now have the financial means to work on a new project for some time; we also have a proven reputation and a community of challenge-loving players. It sets us up to really turn Spire into the best thing it can be. That's something worth more than just the money we made.